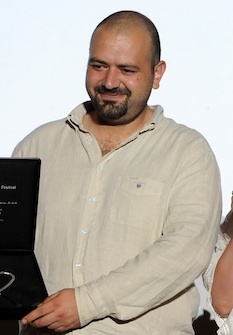 Syrian filmmaker and producer Orwa Nyrabia was arrested in Damascus International Airport while traveling to Cairo at noon on Thursday, August 23rd, 2012. Nyrabia’s family still have no information about the reasons for his detention and his whereabouts are still unknown. freeDimensional joins the Nyrabia family and the international community calling for the immediate release of our friend and colleague Orwa Nyrabia. Nyrabia graduated from the Higher Institute of Dramatic Arts in Damascus in 1999. He participated at the Cannes Film Festival in 2004 for his lead-role in the film “The Gate of the Sun” by Yousry Nasrallah which was based on the Lebanese Elias Khoury’s novel. Nyrabia works as a film producer and is one of the founders of DOX BOX International Documentary Film Festival held in Syria. The festival was initially launched during “Damascus: Arab Capital of Culture” festivity in 2008 under the patronage of the National Film Organization up till 2011. Nyrabia contributed in several Arab and International collaborations and networks to support the documentary film industry in his country and the rest of Arab Region. He was honored as a member of the jury at international film festivals including Ibn Rushd in Tehran and in Amsterdam, Leipzig and Copenhagen among others.